10. How many surgeries does the plastic surgeon perform per day? If it’s more than one, you could be in trouble. Face lift is a demanding surgery, and obsession with details is essential. Every stitch has to be placed perfectly. In skillful hands, a face lift operation, with some ancillary facial procedures, could take up to 6 hours. The surgeon needs to be at his best the whole time and, no matter how well trained he is, there is a limit to his ability to focus and concentrate under tremendous pressure. Surgeons that schedule several cases a day cannot sustain optimal focus and concentration the whole time, and they won’t deliver stellar results. You want to be the first and the only patient of the day! 9. Is the plastic surgeon out of shape? Does he smoke, not get enough sleep, not work out, consume too much alcohol, or use recreational drugs? To perform at his best, a plastic surgeon needs to be fit. Face lift surgery can be long and physically demanding. To perform at his peak, he needs to be in top shape – like an athlete ready for a competition. 8. Is his/her office too busy? Contrary to popular belief, a crammed waiting room doesn’t mean he is the best. It means he is probably cramming his surgery schedule. It also compromises privacy unless you are going to wear a paper bag over your head in the waiting room. High volume practices simply can’t deliver the best quality or the personal attention patients need during this process. 7. How much time does the surgeon spend with patients in the consultation? 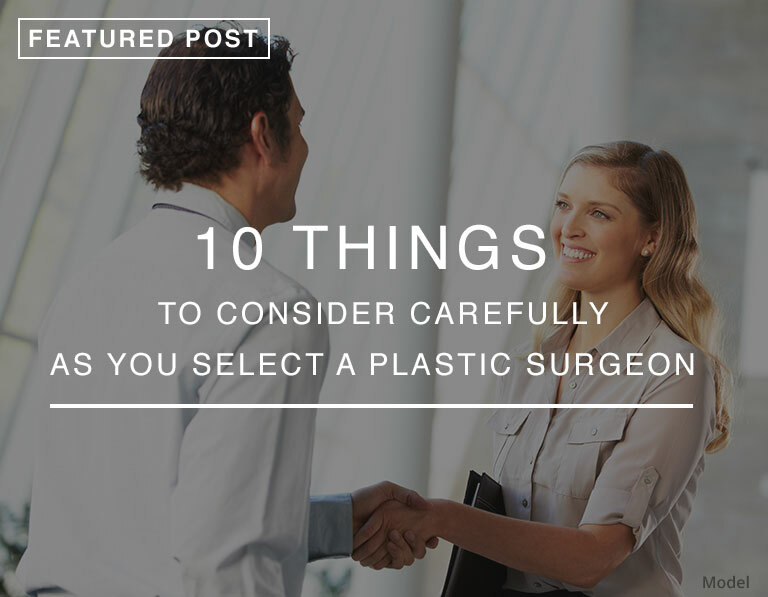 If the plastic surgeon does not spend enough time with you during the consultation, or if you feel rushed, how is he/she going to know what your needs and goals are? Delivering high quality results requires time. 6. Is he/she using a cookie cutter approach for every patient? Every patient is different. Their anatomy is different, the way they age is different, and their life style is different. A “tailored” approach to each specific problem is a must. 5. Does he/she promise you are going to look 20 years younger and your face lift is going to last forever with perfect results? Perfection is impossible to obtain when you’re operating on real human beings, so it’s essential for patients to have realistic expectations. You need to focus on the major improvement not on reaching perfection. You are always going to look younger than before but at some point you may need a touch up. 4. Is he/she on TV all the time? In magazines, on Facebook, on Twitter etc.? A plastic surgeon’s reputation shouldn’t be based on a reality TV show, a gossip magazine, or a good PR campaign. A surgeon’s reputation should be based on his/her skill and ability. The old fashion way of building a practice and a reputation or word of mouth is still the best. 3. Does he/she bad mouth other plastic surgeons in an effort to look good? No matter how difficult the situation is, a good plastic surgeon does not make any negative remarks but focuses on improving the situation in a positive way. 2. Does he/she dictate what needs to be improved instead of listening to the patient’s desires? 1. Are his/her before and after pictures impressive? Surgeons that have been practicing long enough should have lots of good before and after photos to show patients. What you want to see is consistently good results and lots of ’em! Remember, if a surgeon can’t show you a ton of great before and after photos, it means he/she doesn’t have the results. Don’t settle for less. Develop an eye for high quality results, and do your homework. If you are in the process of searching for a plastic surgeon, consider learning more about our facilities, services, and our doctors. We hope we will be able to be the right fit for you.